SEOUL - Three cartoon images, with prototypes for harbor seals from Baengnyeong island off west coast of the Korean Peninsula, were chosen as the mascots for the 2014 Incheon Asian Games, the organizing committee announced on Thursday. 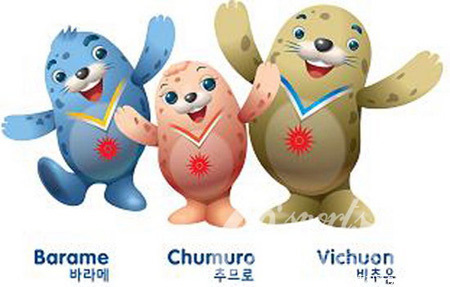 Three seal siblings were named after "Barame", "Chumuro" and "Vichuon", meaning wind, dance and light, in accordance with the theme of the main venue of the Incheon Asian Games, the committee said at the unveiling ceremony held in Songdo island, Incheon. The committee hopes that harbor seals, one kind of rare animals in South Korea, which travel between the two sides of the divided Korean Peninsula freely, will be a symbol for the future peace between South Korea and the Democratic People's Republic of Korea, Lee Yun-taek, the president of the committee told reporters. 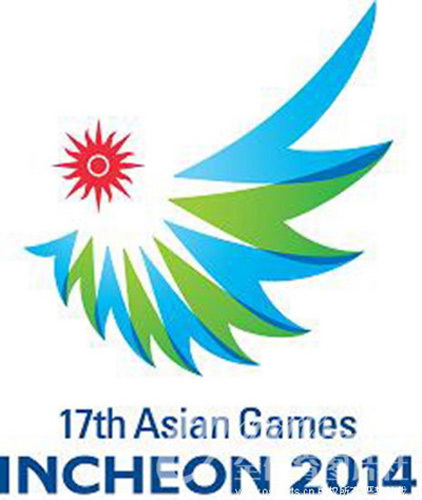 The committee also disclosed the games' official emblem, which depicts a huge wing consisting of a string of "A", the first letter of "Asia", with a shining sun at its upper left, symbolizing the Asian people holding hands in the sky. Taking the upcoming Guangzhou Asian Game, slated on Nov 12-27, as an opportunity, the 2014 Incheon Asian Games' organizing committee is planning to beef up its promotion efforts by disclosing the mascots and emblem, according to local media.